.-= BlueKayak´s last blog ..The Right Workout for Your Needs =-. Wow that looks great and might be the answer to my whole wheat bread issue. I tend to break out with eczema when I consume too much wheat. Unfortunately, following a low fat diet sorta forces me to eat a lot of wheat products. Gonna try this! I just found out about the great benefits of coconut oil. Bread is my favorite snack I will definitely try this out. Usually I don’t look for healthy food but this one as both great oil in it and it’s high protein. Great. Thanks for the recipe. We recently make some coconut cookies and sweetened them with bananas. It tasted a lot like banana bread. We just used shredded coconut, but I’ll have to try the coconut flour. At just under 90g a piece (assuming the recipe above makes 6 servings) you are looking at over 300 calories a piece while exceding the recommended daily dosage of saturated fat. I would seriously like to understand how this has worked well for you over a slice of say wheat bread @ 100 calories a slice. In any case I love your website and I have tried much of your advice. I was once 325 Lbs and now I am 165 Lbs (under 6 months for the bulk of the weight). Hi Quais. I didn’t do any of the math in regards to calories, grams or any of that. When I look at this recipe I see eggs, coconut flour and coconut oil. I see healthy fats, good protein and incredibly high fiber. Coconut oil is one of the healthiest oils you could ever eat. I supports weight loss. It activates the metabolism. It’s anti fungal and anti yeast so kills candida. It’s a medium chain trigliceride and is the “healthy” part of the saturated fats. (Not all saturated fats are bad). The eggs are a protein. They too assist in burning fat, and activating the metabolism. Protein provides a feeling of satiety, or fullness and keeps us from eating too much as well as preventing a blood sugar spike. Coconut flour is also high protein and high fiber. 5 Tbsp of coconut flour contains 27 grams of fiber. All together, a single piece is quite filling, provides quality fat, a good protein and is quite filling with the fiber. 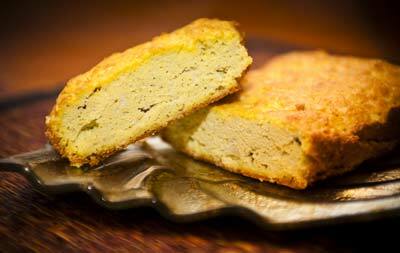 The coconut bread recipe is mostly protein, fat and fiber, with little if any carbohydrates. I’d guess 1 gram per slice and it’s completely gluten and grain free. The 100 calorie whole wheat bread contains gluten, probably dairy products (milk of some sort) and very little else of value. It’s higher on the carbohydrate size, with very little protein or fiber. Whole wheat bread is not a healthy choice in my opinion. The other thing about the 100 calorie slice of bread is that, as you say, “it’s only 100 calories”. One has to ask themselves if 100 calories is enough. The body needs fuel. 100 calories hardly cuts it when in my own case, I shoot for between 3200 and 3600 calories per day. I’m quite active and require more food. Even someone cutting calories can make use of this recipe because with a meal size of say 400 calories, a bowl of soup and a slice of coconut bread would be around the 400 calorie mark. UPDATE: After I posted this comment, I re-read the other ones above. I noticed that Pepper saw this recipe as “a solution to her whole wheat bread issue”. She is sensitive to wheat and probably other glutens, and this recipe is a way for her to provide nutrition for her body that does not result in a “side effect”. Many people cannot tolerate grains or the gluten. Thanks for writing back. There are so many perspectives on diet that I am trying to keep an open mind. Let’s talk about eggs for a second – are you concerned about the cholesterol intake? I would love to eat a 6 egg omelet :), but I worry about the cholesterol alone is too high. I currently do a very fast 5k run daily and burn about 400 calories and I try to eat under 2k calories consisting of mainly lean proteins and vegetables. I avoid dairy and I have minimal servings of breads – 2 slices per week at most. I would like to incorporate more of your recipes (the omelet especially) after I gain some more muscle mass. Right now I am very weak in my strength routines. BTW – if you are ever in Seattle let me know and I would love to pick your brain on how you are maintaining. Your Coconut Bread is delicious. Thanks so much for the recipe. I love it. Can you tell me how many grams a 3/4 of a cup is? I just noticed Amazon has Bruce Fife book Cooking with Coconut Flour. Is that where you obtained this recipe? I’m wondering if its a good book to get. I’d love to replace recipes this way. Thanks. So I did make the bread and was very pleased with it. I had a couple slices with a hunk of cheese and tea for lunch and was satisfied until dinner, not my usual glutonous behavior! Plus, with suspecting I have candida, this is a perfect transition. I would never have heard about it if not for your website. Thank you. @Christina, if you’ll have another look again, up above, below the recipe, I give the recipe credit to Nourishing Days website. It’s not from the Bruce Fife cookbook. Glad you liked it, and yes, it’s a great solution to keeping oneself satisfied. It’s very filling. As for your candida suspicion, what else are you doing about it? I would love to recommend some things you can do quite easily and effectively that also support your overall health, not just getting rid of Candida. 1. Glutamine (or L-Glutamine, same thing) 4x a day. Helps heal the colon, closing the holes in the lining (leaky gut). Also anti-stress, improves immune system function, reduces / eliminates carbohydrate cravings (including alcohol). 2. Coconut Oil – replace all your cooking oils with coconut oil. It’s high Lauric acid content is anti-bacterial, anti-fungal. It kills candida. Coconut oil burns fat, improves metabolism, plain and simple. and 3. Olive Leaf – usually taken in the form of capsules. Is anti-fungal. @Jeroen – I have NO idea. @Quais – I’m not the least bit concerned about Cholesterol. The media portrays cholesterol as the enemy and it’s not. Our bodies need cholesterol and produce it on it’s own. IF we reduce cholesterol intake, our body makes more to keep the levels balanced as it needs and vice versa. Cholesterol is not the enemy. now, that said, an increase in cholesterol in the body is in direct relationship with the presence of yeast in the blood. Yeast is NOT supposed to be in the blood. (Candida). Yeast in the blood is usually due to leaky gut syndrome (see above for solution). When it’s in the blood, it irritates the body, so the body has to protect itself from the irritant. The body uses cholestrol and mucous to do this. the more yeast one has, the more cholesterol. Doctors prescribe statin drugs to reduce cholesterol. Guess what. Statin drugs are anti-yeast medications. Whenever I see a drug that is designed to address a situation, I look at the source of the situation and then address it naturally. With high cholesterol, it’s simply a matter of reducing yeast. 4. Drink Kombucha Tea and pure distilled water as your beverage choices. then… dont ever stop those habits. These habits keep the colon functioning at optimal levels. When you’re digesting your food properly and getting full value out of the foods you eat, your whole body works the way it’s supposed to. Rob I just stumbled upon your website tonight, but I’m really loving your advice! I’m…well quite overweight at this point. I’ve been gaining since I quit smoking 5 years ago. I’m working my way down now. I’m taking 3 gel caps of coconut oil before each meal (= 3,000 mg), it helps get the thyroid going again as well and they’re only like $5 a bottle. I agree with you this is a wonderful oil, and I can’t wait to try your recipe! I see people comment about eggs and cholesterol. Eggs contain a natural binder to the cholesterol that gets destroyed with cooking. I have added my eggs raw to my fruit smoothie for this reason (and other reasons). I wouldn’t do it with store bought eggs (yuck, who knows where they come from) but for nearly the same price I find mine at a co-op or from a farmer. Well, we have our own egg layers now. I wipe mine down with a little alcohol and let it sit on the counter while I’m peeling my mango. That cleans off potential bad bacteria, but a person with a healthy flora/gut shouldn’t have to really worry about those things. I think it’s all the sugars we consume that make us so suseptable to a litte bit of bateria causing illness. There I wander off in thought. Well, I’m just really liking your articles I’ve seen so far. I’m going to read on! Thanks! This is a phenomenal site. So rare to find bodybuilders who are hip to things like raw food, food combining, etc. Really nice work. Thanks for it. Ever considered doing a piece on bodybuilding advice for raw vegans? This looks like a great recipe, but where do you get coconut flour? @Debby, Where do you find coconut flour? – just about anywhere. I’ve never had trouble finding it. Probably have to be a “healthier” food store though.. not your basic item in an IGA, Safeway or Walmart. It’s out there though. @electricEel, The best bodybuilding advice for a vegan is: stop being a vegan. It isn’t healthy. You’re eating way too many grains that are destroying your digestive system and you aren’t getting the protein and fat your body needs to survive. @electricEel, not sure I completely agree with @Zach, but yes and no.. I’ve thought about it. I was vegetarian for 12 years and vegan for 2 of those twelve, gaining 50+ pounds of muscle while being vegan. @Zach… it’s possible to be vegan without consuming grains you know. There’s a LOT more to it than just “being vegan is bad”. There’s their geographical location to take into account too. ie: being vegan, especially raw vegan in the northern hemisphere year round is not a good idea, but that’s a whole other story. I’ve got TONS to write about… it’s about finding the time lol. Cool idea. But I’m not a huge fan of the taste. My quest for healthier eating is not over. Can i use egg substitutes ? for egg allergies , we have dairy , soy wheat , gluten , eggs allergies and or sensitivities amoung myself and two out of three children , i am concerned about my 5 years old daughter malsorption issues she dont gain weight and this recipe might help out 🙂 do you think that wouldbe accurate :). I found a good way to keep baked things from sticking in the breadpan–just oil pan with coconut oil, sprinkle with chia seed, tipping pan to coat areas where the batter will be touching, add batter and bake. The chia seed adds to the texture of the crust and “bread” comes right out easily. walking around with high cholesterol and low vit. D, maybe! but this recipe is so easy, I can’t resist giving it a try. tablespoon twice a day straight! Just popping by to say that I’ve enjoyed this post, this recipe and the discussion that follows. I’m on a coconut flour kick right now and will try this, and I’ll definitely be checking out more of your site. Rob, I use Coconut products daily for the health benefits, but due to allergic reactions, have not been able to effectivly use the flour due to the need to combine with eggs (usually) as in this recipe. Any experience in making this with egg substitutes? @Morgana, I use coconut flour in many places without eggs. My favorite is as a coating for liver. I put coconut flour, sea salt and fresh ground pepper into a zip lock bag and then use it to batter my liver. I’ve done chicken the same way. No eggs. Just coconut flour and spices. @Mir, sure, try egg subsitutes. The egg just helps the coconut flour bind. As for your egg allergies, my I suggest reading more about pasture raised eggs. I’m told by many a farmer of pasture raised eggs that their clients who’ve said they’re allergic are NOT allergic to the pasture eggs. Just store bought eggs. They’re completely different in many respects. I’d suggest you look into it AND find a local farmer who raises “pasture raised” eggs, not free range. Free range is a political joke and has nothing to do with health or ethics. Thankyou and i have had much success with naturally grown eggs i have made a entire food switch over , the whole house is feeling better ! even my hubby (skeptical) noticed his guts were not bothering him anymore , so he went on eating the “old stuff ” and felt instant IBS symptoms …go fiqure guess you have to try it to make sure ..now i think his eyes are open to the fact .